This is Grace’s favorite cake and I bake it often for that reason. A mash-up of recipes inspired by my favorite food blogs, it’s incredibly easy to make and is decadent without being too heavy or too sweet. The frosting, a total small victory because of its simplicity and ingenuity, was inspired by a post that I bookmarked years ago from Deb Perelman’s Smitten Kitchen. To make it, you simply whisk together room temperature sour cream with melted chocolate and a little maple syrup. How smart is that? The cake itself, a riff on one from Jenny Rosenstrach’s Dinner: A Love Story, is a classic “dump cake,” (the worst name ever, I know), which means you put everything in one bowl and stir it together. Small victory: No huge mess, no creaming butter and sugar, no fuss whatsoever. A great sum of simple parts, this is my kind of baking. This cake is great right away after you assemble it, but is truly at its best served cold out of the refrigerator. 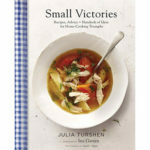 Excerpted from Small Victories by Julia Turshen. Published by Chronicle Books. Text ©2016 Julia Turshen. Photograph ©2016 Gentl + Hyers. ON-DEMAND: Listen to Faith and Julia discuss this recipe and others from Small Victories on The Faith Middleton Food Schmooze®. Julia uses raspberry jam in between the layers, but you could swap it for any flavor jam you like (or make an extra batch of frosting and use that). Preheat your oven to 350°F [180°C]. Use your hands to butter the bottom and sides of two 8-in [20-cm] cake pans, then line the bottom of each with a circle of parchment paper. For good measure, butter the parchment paper. Set the pans aside. In a large bowl, whisk together the flour, sugar, cocoa powder, baking soda, baking powder, and salt. Add the melted butter, eggs, coffee, buttermilk, and vanilla and whisk until the batter is smooth. Divide the batter evenly among the prepared cake pans (my friend Larry suggests using a cup measure to be accurate). Bake until the cakes are firm to the touch and a toothpick inserted in the centers comes out clean, about 30 minutes. Transfer the cakes, still in their pans, to a wire rack and let them cool completely. Once cool, use a dinner knife to loosen the edges of the cakes from the pans and invert them onto your work surface (you might need to give the pan a little whack). Peel off and discard the parchment. Meanwhile, bring a small pot of water to a boil and then lower the heat to a simmer. Put the chocolate chips in a large stainless-steel or heatproof glass bowl and set it over the pot (the water should not touch the bowl—if it does, simply pour some out). Stir until the chocolate is melted. (Alternatively, you can melt the chocolate in a microwave in 15-second increments, stirring between increments.) Remove from the heat and whisk in the sour cream and maple syrup. The frosting should be smooth and quite silky. Refrigerate the frosting until the cakes have cooled. It will thicken as it cools (a good thing). Once the cakes are cool, put one on a serving platter upside-down so that the flat side is facing up. Spread the jam over the top. Put the second cake on top of the jam-slathered cake, again flat-side up—this way you get a nice flat top. (If the jam makes the layers slip and slide a bit, use a couple of skewers to hold the layers together while you frost the sides and then remove the skewers to frost the top). Using a small offset spatula or a dinner knife, spread the frosting all over the sides and top of the cake. There’s no need to be perfect with this; I like it kind of rustic looking. But if you’re more of a type-A person, go ahead and smooth the top and sides (and you could even stick strips of parchment paper under the bottom of the cake before frosting it to keep your serving platter clean). Whatever makes you happy. Let the cake sit for about 1 hour before serving. There’s something about letting each element get to know the others that serves this cake very well. In fact, I prefer to make it the day before and refrigerate it overnight, and serve it cold. Either way, slice and serve with some fresh raspberries alongside if you’d like. Note: If you only own a single cake pan, fear not! Simply pour the batter into the pan and bake it until a toothpick tests clean (it will take 10 to 15 minutes longer in the oven than the two separate layers). 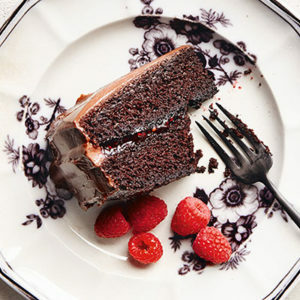 Once the cake cools completely, use a serrated knife to cut it into two layers. Voilà. FOR CUPCAKES, distribute the cake batter in a standard 12-well muffin tin lined with paper liners and bake until firm to the touch, about 20 minutes. Top with raspberry jam and/or the frosting. FOR VANILLA CAKE, leave out the cocoa powder and coffee. FOR THE QUICKEST VANILLA FROSTING, whip 1/2 cup [120 ml] heavy cream until stiff peaks form and fold in ½ cup [120 ml] room-temperature sour cream. Sweeten with powdered sugar and add a splash of vanilla extract. Our guess is that the flavor would be good. Perhaps different from Julia’s original, but still good (I mean, when is chocolate not good?). But you should note that Dutch-processed cocoa contains acids that natural cocoa does not. Acids in baking are important and effect flavor, texture, etc. You might have to experiment to get it right if you switch up the chocolate. 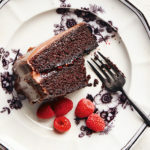 I have searched and searched for a beautiful chocolate cake….not too sweet with just the right kind of chocolate flavoring. How perfect this recipe is! Thank you for sharing. I just made it and it is toddler approved! I’ll investigate ‘Small Victories’ further. I do enjoy your show and all the wonderful tidbits your team has to offer! So glad, Ana. Thanks for the kind words! I made it and it was thee BEST chocolate cake recipe I’ve ever made! Hi, I can’t find dutch cocoa in my area. Can I use Hershey’s? Would it change the taste?